Sometimes life just isn't fair. Heather Bailey (don't look at her blog unless your superhero power is resisting jealousy) has way too much talent in her sweet family. Her sis in law Laura Gunn (don't look at her's either) has come up with an amazing storage solution. Useful and delicious eye candy all at once. 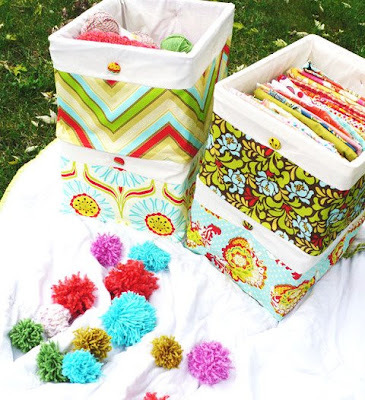 She has clear and easy directions on how to slipcover ugly plastic storage crates. I don't know what makes my heart beat faster, the photography, the fabric, or the fact that I recently packed up some of these same crates and dropped them off at Goodwill because they were so yuck. My plan was to have these done for today's post. I bought all of the supplies (kind of had them, you know that fabric obsession problem I am dealing with) except the crates. Wal-mart? Nope? Target? Nope. Not too sure where to look next, but I am braving errands with Lucy today, it is that important to me. Insanity, I know, but look at these things! (((Edited: I found them at Staples! Hooray))) I am sure that people with big houses probably struggle with storage too (sorry, I don't feel too bad for you), but I really, really struggle in our humble storage-free house. Today is free-dress day at Halley's school. Well, technically "uniform free" dress day... they always have specific guidelines... today's guideline is "Christian T-shirt and Jeans day." Well, it is 90 degrees out, so jeans were out of the question, and her jean skirt is a little too scandalous for the "middle of the knee" dress code, thus the leggings. Love to bring the 80's back! You can see the ice cream cone embroidery from this post. I am happy to say that it has survived multiple washings without unraveling. I totally credit Sublime Stitching for teaching me how to properly secure the stitches. The hair flowers are from this post. I broke down and used my Urban Chiks charm pack that I have been hoarding. It was difficult to cut up, but when I was done I was really happy. So much cuter in Halley's hair than sitting in a drawer. Why have it if you don't plan on using it right? Plus, I gained more storage... Lastly, Halley isn't really much of a t-shirt girl (probably because her wardrobe-control-freak-mom isn't much of one either) so I made her a I heart Jesus shirt from this post. She was shouting it all morning! I am wishing there were more free-dress days. Uniforms are so easy and super cute, but I miss sewing for her. Lastly, sometimes I look at my kids and wonder where they came from. It kind of freaks me out. How in the world can our genes produce such beauty? I see my dimple and curly hair (mind you a much better version of it) but beyond that? Not really looking forward to the teenage years, you know? She is adorable! I love that color on her, and the Jesus shirt, too cute! Aren't those crates the best? A friend linked me up to them last week and they now have an exclusive spot on my (rather long) to-do list. Love the t-shirt! Great idea! hey, Thanks for the comments. It all started when I saw that you decopauged(?) those tin buckets...You made me get a blog and now I love it. I need to start putting my crafty stuff on there soon. LOve your blog! I *heart* that shirt!! I might would even wear it!! And BOTH of your girls are beautiful!! Cute crates by the way. Have your tried Staples or Office Max? Maybe even Joann's or HL would have them. This is just all too cute!